Nishiki-dori Avenue there is a 400-year-old (food) market, 390 m east to west. Approximately 145 stores such as fresh fish and dry matter line up narrowly and are called the kitchen of Kyoto. A museum that comprehensively introduces the culture of Kyoto. Pioneering masters and works of contemporary art and craftwriters in Kyoto etc are always visible. Tendai Sect temple called Mt Shiun Chohoji temple Tendai Sect temple. Muromachi Time Period, faith was gathered as Shimogyo no Chodo of Shimogyo no Chodo, and the main hall was called as Rokkaku-do Temple from the shape of the Rokkaku-do Temple and it has been popular. It is known as Saigoku Pilgrimage number 18 Nation, the family of Flower Arrangements, the Temple of the Ikenobo Clan. Nichiren Sect Temple opened in the Muromachi Time Period. Tensho years (1582) Mitsuhide Akechi we are known in the Honnoji Incident was attacked Nobunaga Oda. 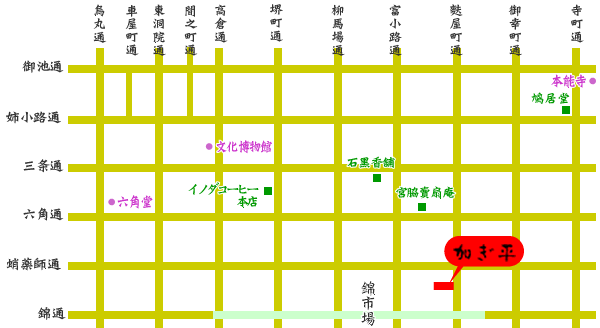 The era is in Nishinotoin Shijo Bomon, Nishinotoin Shijo Bomon, and we moved to the present location when building a Teramachi Hideyoshi, and there is a Nobunaga Mausoleum the precincts. A new road opened from about the Meiji 5 Meiji, from the beginning a theater hut and a restaurant were on display and many people crowded. Taisho Period, the cinemas are lining up, and it is always the first downtown area in Kyoto today. In the Edo period, there is a prototype of the modern shopping street, after Meiji, Taisho and Showa, Teramachi dori is always old and new attractive shopping street. In this shopping district connecting Sanjo-dori and Shijo-dori Avenue there are a wide variety of shops, mainly clothing and grocery shops. It is one of the biggest shopping streets in Kyoto, one of the most popular cities in Kyoto. There are many stores dealing with traditional products representing Kyoto, as well as three department stores, Takashimaya, Daimaru and Fujii Daimaru, large-scale stores of financial institutions and overseas brands.